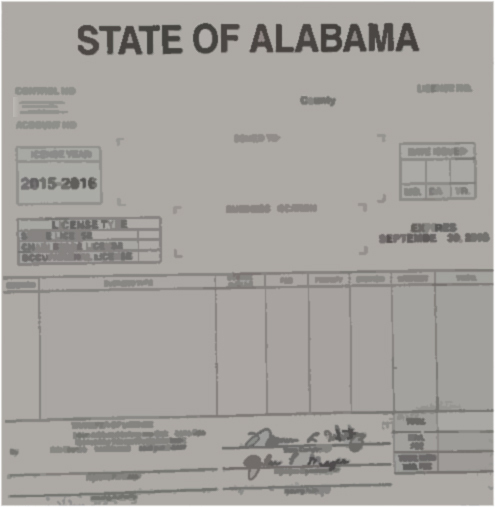 Rules and regulations concerning application for Alabama certificate of title are specified and regulated by Alabama Department of Revenue. Inquiries or concerns may be addressed to Motor Vehicle Division - Title Section, P O Box 327640, Montgomery, Alabama 36132-7640. The office location is at the Gordon Persons Building in Montgomery (titles@revenue.alabama.gov). The State Motor Vehicle Department will not accept any document that has been altered. This includes any type of fluid or means used to remove, delete, or cover up previously entered information. o	New vehicles - Application for first title. o	Out-of-state vehicles - Brought into Alabama and surrender out-of-state titles. o	Other vehicles - Not currently titled and subject to Alabama title law. o	All non-title vehicles being registered for the first time in a new owner's name and not registered in Alabama within the two previous calendar years. An application for a certificate of title shall have the name of the vehicle owner on the title application form (MVT 5-1C). The signature of owner must be the individual owner signature or a Power of Attorney (download form) appointee. If joint ownership is reflected names joined by 'AND' then, 'BOTH' owners must sign the title application. No more than two owners shall be listed on an application for certificate of title. The proper assignment of title by the registered owner or selling dealer is a necessary part of the transfer of a vehicle. The signature of the seller must meet the Revenue Department's requirements for transfer of title. Seller must sign exactly or more than name shown on face of title e.g. Blackwood James M on face of title should sign legal signature as James M. Blackwood. James Marshall Blackwood is also an acceptable signature. The listing of Davis Wm T on face of title should sign legal signature as William T. Davis. When a vehicle enters this state from a title state and an application is made for an Alabama certificate of title, the original out-of-state title or replacement title shall be surrendered. A leasing company located outside of Alabama, which leases a vehicle that will be domiciled in Alabama, shall furnish the residence address of the lessee and grant power of attorney (download form) to an appointee to sign title application. The lessor shall always be named as owner and title shall be mailed to owner's mailing address as provided. If the out-of-state title is held by a lien holder, then a copy or electronic copy of the original title record may be provided and the new resident may receive vehicle registration only with the out-of-state title remaining with the lien holder. The titled owner(s) assigns the title to the purchaser(s). If the purchaser is a licensed auto dealer, then he may reassign the title to the next dealer, etc. If a title is assigned to an individual or firm who is not a licensed auto dealer that party must first obtain title in their name.